Rabbit Heart is a game concept being developed by Paul and Gareth for educational purposes, it’s to show students concept work and what is needed when developing a game. From what i have researched it is a free roaming open world puzzle game with action elements to it. You play as lead protagonist Ululu who is a young girl that has crashed her spaceship on a strange unexplored planet, armed only with her laser pistol she goes exploring. Whilst exploring she finds a giant rabbit exo-suit that reminds her of her toy rabbit that she has lost, she somehow activates it and it comes with her. 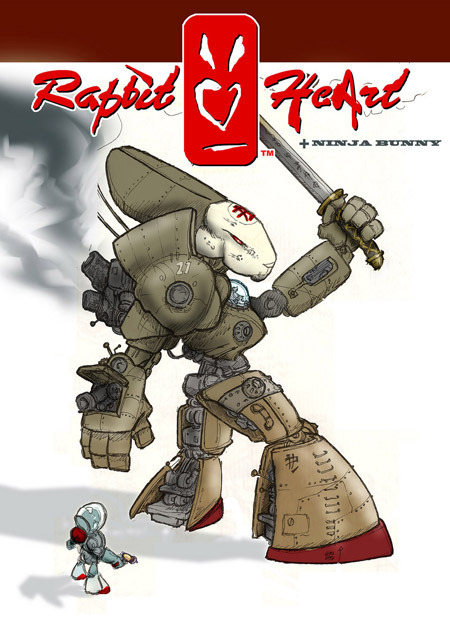 Ululu can go into the rabbit exo-suit and control it, the cockpit is located in the chest and that’s why the game is called rabbit heart. From my research i will design some HUD’s for each player mode and maybe design a menu system.